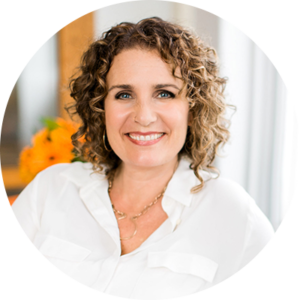 Listen in – I’d love to hear how this approach brightens your world! Hi there, Michelle Barry Franco here. I want to talk with you about the magic of glorifying others. So last week on the blog I talked about the fear of being judged and how judging is our brain’s job. It’s totally normal and your audience is judging you and me. And we know that because as audience members we judge speakers. We judge all the people that we meet actually. Again, it’s our brain’s job. Today I want to talk about a practice you can put in place that actually changes your perceptions of those judgments. And this is the magic of glorifying others. So you know how we just sort of tend to default to thinking that other people think kind of similarly to the way we do. That’s why we’re really surprised when a friend that we’ve been hanging out with for a while but maybe haven’t been around them while they were parenting, that they actually parent really differently than we do. We just had this assumption that most people have, especially the people that we hang around with, have similar ways of thinking that we do. Or it could happen with a girlfriend and her beliefs around politics or family overall, that kind of thing. So we have this kind of our brains sort of sets the tone for the way we think the rest of the world is thinking. Now I know that we have a whole set of, or sets of other people who we know think very different than us. But I’m talking about the people who are closer in our sphere we have this sort of assumption. 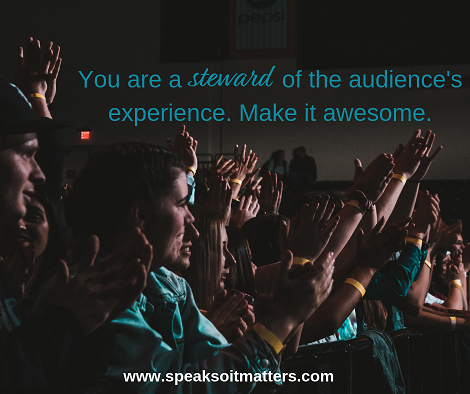 So when you’re standing in front of an audience, usually this audience is not of people who are entirely way different than you are because you’re serving with your own stories and expertise and lessons learned. And resonance often happens because there’s some amount of expected shared experience. But suddenly we go into this mode of like oh, they’re going to judge us negatively. There’s this idea that they’re going to judge us negatively. Part of that’s because we’re doing maybe more judging negatively than is serving us in our life. So when you put a practice in place of judging, of positively judging other people around you, you will set the tone for assuming that your audience has more positive things to say as well. This is going to take some practice. So I suggest you start now. The very cool thing is it starts feeling better almost immediately. Actually immediately. It’s kind of like a gratitude practice. Even though I have sort of mixed feelings about gratitude practices if they’re not sort of done in a certain way, when they’re done in a way where you’re really connecting with a true gratitude in you, immediately you’re like wow, I just feel so much better. Well, this same thing can happen when you are continually walking around and noticing the smart and beautiful and wonderful things in other people, the wonderful ways they’re contributing. So notice around you when people say something really clever when you love the way that they say it, and you might even go a step further and say to them wow, that was a really, that was a super clever way to say that. Or I have never heard that word before. I am so using that word. So when somebody impresses you, notice it and say it. And it will help to start anchoring it in your own mind that these are thoughts that people can also have about others. So you can practice it when you’re in the audience when you’re an audience member, write down all the things you love that that speaker is doing. 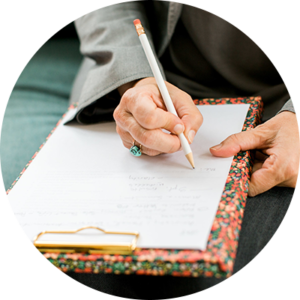 By the way, you’re making a list of awesome things that you can bring to your own speaking. Little side benefit. But you will start to train your brain to think more positively, and then you will start to make more positive assumptions about the way other people think. So that is the magic of glorifying others. Start today. All right. See you next week.